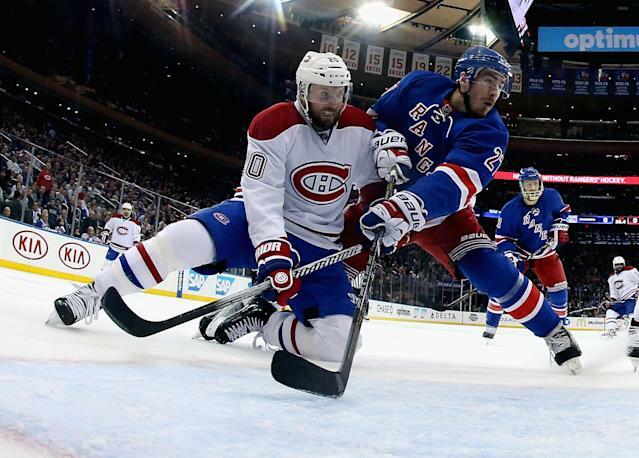 Early in the 2013-14 season, Thomas Vanek's future looked clear. To hear many in the hockey world tell it, he was going to Minnesota, to be reunited with longtime buddy Jason Pominville. It wasn't a very well-guarded secret. When Garth Snow traded for him, most thought, good luck -- he's going to Minnesota. But now it might not be such a foregone conclusion. After watching him struggle with Montreal in the postseason, it would appear the Minnesota Wild are getting cold feet. You will hear this term a lot leading into free agency: There is a “price point” the Wild is willing to reach for certain players. Thomas Vanek is no longer a given. Four or five months ago, I think it was a given. But the bright future that many of the kids provide the Wild coupled with Vanek’s tough postseason with Montreal has changed things. The Wild has a lot of players 28 and older, a lot of players 24 and younger. You don’t want to get too many players north of 30 on long-term deals, so there’s a specific price point I think the Wild’s willing to reach with Vanek. I don’t get the impression the Wild’s willing to sign him to a long-term deal anymore. Vanek will have good options in free agency, so is he really going to sign in Minnesota for two or three years? Hard to believe, especially after reportedly turning down a seven-year, $49 million deal with the Islanders. While that contract probably won’t be on the table with any team anymore, he certainly should still be able to get decent term of four or five years with some teams. A player of Vanek's caliber actually making it to free agency is becoming a rare thing, and Vanek's own journey this year is evidence of why. Once you set your sights on July 1 as the first day you'll even consider picking up a pen, you're strapping yourself in for a wild ride that might -- and in Vanek's case, likely did -- hurt your value. This was supposed to be his big moment. At 30 years old, this is the summer where he signs what's likely to be his last big contract, and for once, with a team that has a legitimate shot at contending, especially after he comes onboard. He fought for his right to test unrestricted free agency, saying no to an extension in Buffalo, then turning down nearly $50 million from the desperate Islanders. Then he got dealt to Montreal, when the Islanders gave up. There the weight of expectations, combined with an admitted lack of chemistry with his linemates, made him look less like a game-breaker than he did in Buffalo. And less like the sort of guy you want to throw all your money at. Vanek's still gonna get so paid, but in a way, I sort of feel for him.